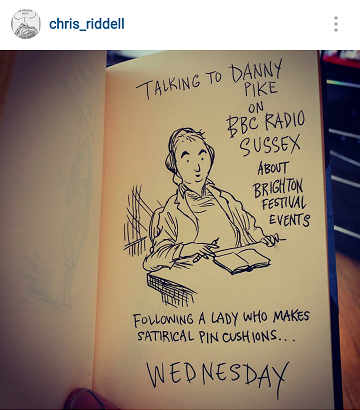 BBC Radio Sussex and Chris Riddell! On 4th May 2016 I was invited to talk to Danny Pike on BBC Radio Sussex about "quirky businesses". It wasn't my first time in the studio - I had been in twice previously with Neil Pringle (see press page for the recordings!) - but I like to think there is a marked improvement in the quality of my contribution, as I was really nervous the first two times but less so on this occasion, two years later. 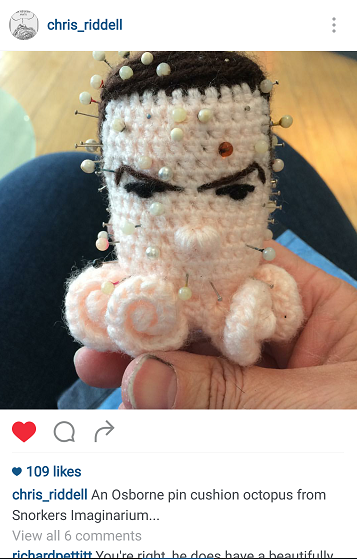 On my way out after the interview I was stopped by a man who had been listening in the green room and wanted to have a look at my pincushions. Blow me down if it wasn't the mighty illustrator and Children's Laureate, Chris Riddell!! He was absolutely lovely and said lots of nice things about my work - some of it on air in the interview after mine, which made me feel very warm inside.